↑ "Table of blood group systems v4.0" (PDF). International Society of Blood Transfusion. November 2014. Retrieved April 9, 2015. ↑ "Table of blood group systems". International Society of Blood Transfusion. October 2008. Retrieved 2008-09-12. ↑ Stayboldt C, Rearden A, Lane TA (1987). 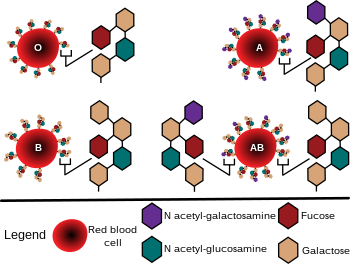 "B antigen acquired by normal A1 red cells exposed to a patient's serum". Transfusion. 27 (1): 41–4. doi:10.1046/j.1537-2995.1987.27187121471.x. PMID 3810822. ↑ Matsushita S, Imamura T, Mizuta T, Hanada M (November 1983). "Acquired B antigen and polyagglutination in a patient with gastric cancer". The Japanese Journal of Surgery. 13 (6): 540–2. doi:10.1007/BF02469500. PMID 6672386. ↑ Kremer Hovinga I, Koopmans M, de Heer E, Bruijn J, Bajema I (2007). "Change in blood group in systemic lupus erythematosus". Lancet. 369 (9557): 186–7, author reply 187. doi:10.1016/S0140-6736(07)60099-3. PMID 17240276. ↑ "Your blood – a textbook about blood and blood donation" (PDF). p. 63. Archived from the original (PDF) on June 26, 2008. Retrieved 2008-07-15. ↑ "Rh血型的由來". Hospital.kingnet.com.tw. Retrieved 2010-08-01. ↑ Joshua E. Brown (22 February 2012). "Blood Mystery Solved". University Of Vermont. Retrieved 11 June 2012. ↑ Nickel RG; Willadsen SA; Freidhoff LR; et al. (August 1999). "Determination of Duffy genotypes in three populations of African descent using PCR and sequence-specific oligonucleotides". Human Immunology. 60 (8): 738–42. doi:10.1016/S0198-8859(99)00039-7. PMID 10439320. ↑ Fauci, Anthony S.; Eugene Braunwald; Kurt J. Isselbacher; Jean D. Wilson; Joseph B. Martin; Dennis L. Kasper; Stephen L. Hauser; Dan L. Longo (1998). Harrison's Principals of Internal Medicine. McGraw-Hill. p. 719. ISBN 0-07-020291-5. ↑ "Universal acceptor and donor groups". Webmd.com. 2008-06-12. Retrieved 2010-08-01. Dean, Laura (2005). 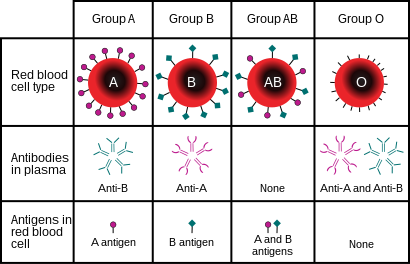 Blood Groups and Red Cell Antigens, a guide to the differences in our blood types that complicate blood transfusions and pregnancy. Bethesda MD: National Center for Biotechnology Information. ISBN 1-932811-05-2. NBK2261. Mollison PL, Engelfriet CP, Contreras M (1997). Blood Transfusion in Clinical Medicine (10th ed.). Oxford UK: Blackwell Science. ISBN 0-86542-881-6. "Blood Facts – Rare Traits". LifeShare Blood Centers. Retrieved September 15, 2006. "Racial and Ethnic Distribution of ABO Blood Types – BloodBook.com, Blood Information for Life". bloodbook.com. Retrieved September 15, 2006. 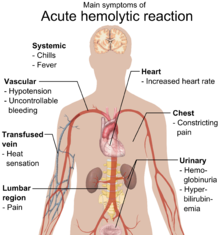 "Molecular Genetic Basis of ABO". Retrieved July 31, 2008.